The Gamsberg Mountains have often been nicknamed "Namibia’s Table Mountain" due to its flat top line. 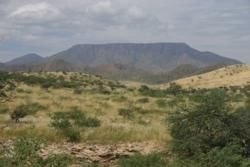 The pass that leads through these mountains to the south is the longest and highest in Namibia. Reaching up to 2350m above sea level, the mountains mainly consist of granite. The area offers many different types of accommodation as well as a range of activities. Sunsets in the region display the wealth of colors unique to Namibia.